Dean Keller: bass clarinet; Kristin Shiner McGuire: marimba; Kyle Vock: acoustic bass; Matt Bevan-Perkins: percussion; Mark Collins: flugelhorn (on track 5). Recorded at The Studios, Finger Lakes Community College, June, 2015. 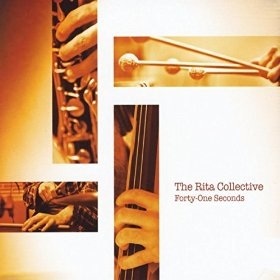 The Rita Collective bills itself as a chamber group (from Rochester, N.Y) which plays jazz and world music. Unpicking this description gets some ways towards both the approach of the group and the mix of seriousness and mischievousness in the way they approach their art. Which other ‘chamber group’ would play a cover version of Rage Against the Machine’s ‘Killing in the Name’? This was the tune (UK readers might recall) that famously beat the manufactured ‘hit’ single of the X-Factor franchise to the Christmas number one spot in 2009 (following a massive social media campaign). While this is probably not the reason for the band to include this piece, there is something of the spirit of this rebelliousness lurking in the background to the playing here. First of all, consider the peculiar and very original mix of instrumentation: the bass clarinet and the marimba are perfect foils for each other in their low registers, and the acoustic bass provides just the right level of counterpoint. Of course, we don’t expect to hear percussion in a chamber group but Bevan-Perkins offers a solid grounding to all of the pieces played in this set. The use of the lower register on this set is, in part, a tribute to the oud playing of Anouar Brahem, whose ECM recording ‘The Astounding Eyes of Rita’ inspired Keller to form this quartet. Brahem provides two cover versions in this set – ‘The Astounding Eyes of Rita’ and ‘Dances with Waves’. I am looking forward to hearing their take on Brahem’s ‘Stopover in Dijbouti’, but guess that will be for the second CD. In addition to the three covers, there are originals by Keller, David McGuire and Shiner McGuire. Keller claims that his piece ‘Slow Snow’ was the first piece he composed for the group and then suggests that it was the first piece he had ever composed. Regardless of whether it is true of not, this is a real gem of assured thematic development, over three sections, with the group weaving their instruments in a relaxed style that really does bring jazz into chamber music. Elsewhere, ‘Sky Sketches’ features Collins on flugelhorn in a reimaging of Miles Davis ‘Flamenco Sketches’. The two McGuire pieces provide sophisticated rhythmical development on elegant tunes. Bassist Karl Vock says of ‘Dark Heart’ that it is “like the inner workings of a clock with many little parts all ticking away…” The set closes with two marimba-led pieces from a larger suite by Shiner McGuire; both are slow but spiky modernism and it would be interesting to hear the rest of this suite. Overall, this set shows The Rita Collective to be developing their novel combination of instruments and playing an original mix of musical styles in a setting that pushes and pulls the concept of chamber music in new directions. I am looking forward to their next outing.